Every successful relationship works via a careful process of give and take. We need to learn how to express ourselves, our ideas, and our interests. Equally, though, we need to really listen. Proactive listening can prevent a lot of issues and roadblocks in our private lives; this is something that experts everywhere agree upon. But is direct communication and feedback as important in the office environment? The answer is a resounding “yes.” Managers need to call upon their employees and listen to their ideas, encourage them to share their insights and take on feedback without judgment. Incorporating regular feedback discussions into your performance management systems can result in a number of tangible benefits, as listed below, yet many companies appear to be sorely lacking in this area. According to a poll reported in John Izzo’s 2012 book, “Stepping Up: How Taking Responsibility Changes Everything,” an incredible 64% of the respondents in the US and Canada recipients agreed that their company’s biggest problem was ‘leaders making decisions without seeking input’. Below, we’ll explore how soliciting and seriously considering employee feedback isn’t only the decent thing to do; it can have a serious impact on employee performance and productivity in the long term. We all know that employee engagement is critical to business success and employee motivation. Your employees can become disengaged for a number of reasons. They might not feel challenged, frustrated with the lack of development or progression opportunities, or feel that their input is never taken on board. It can be upsetting for employees to feel superfluous in an organization, so showing your employees you value them and their opinions can go a long way to countering disengagement. Show your employees that you are all valued members of the same team and, as such, everybody’s input, is valid. If they have an idea on how to improve productivity, or they suggest a workplace process to simplify, take the time to seriously consider their proposals. If you put their ideas into action, the employee will receive a serious sense of satisfaction and they will likely feel far more appreciated as a result. The detrimental effects of ignoring or dismissing employee ideas can be seen in a rather disheartening poll. 38% of Izzo’s poll’s respondents stated that when their ideas were dismissed, this led to a lack of initiative and creativity. After all, if your ideas regularly get shot down or ignored, what incentive do you have to continually push and come up with inventive ideas in the future? Creative employees can benefit your company in a number of ways. They come up with innovative solutions to difficult problems, they can foster greater levels of team bonding, and they can increase staff morale. The last thing you want to do is to discourage this trait in your employees. Instead, show your workforce that you reward and appreciate their unique insight and out-of-the-box thinking. You might even be surprised at how much creativity can benefit your bottom line. As a case study, we can look to Amoco, a chemical and petroleum firm. It’s Texas-based plant incorporated an employee suggestion plan that reportedly saved the company over $18 million in two years. Do your employees get enough feedback themselves? Is this feedback meaningful and helpful? Do they feel that their objectives are realistic? Are they being given the development opportunities they crave? These are all important questions to ask employees, and getting this feedback can make a huge difference to your performance management program. Addressing issues in these areas can have long-lasting effects, including improved employee morale, increased retention, and improved productivity. If managers never ask for feedback on the system that is meant to be inspiring great performance, you can’t be surprised if performance plateaus or even plummets. No manager is perfect. Everyone has a weakness they need to work on or overcome. There is no way a manager will be able to strengthen and improve if they are surrounded by yes-men who are afraid to speak up and constructively criticize when necessary. Employees feel comfortable telling managers they don’t feel they are getting enough recognition. They should also be able to tell managers that they are worried their skills aren’t being put to effective use. Maybe an employee believes that a manager’s approach to a certain project is wrong. This is all useful information to have and to learn from, and for this reason managers should ask employees for feedback during every performance review discussion. It isn’t always about how employees can improve — sometimes managers need to improve, too. One source shows 75% of employees are more likely to stay at a company that listens to their feedback and addresses their concerns. This statistic makes perfect sense when you consider the fact that companies that listen to employee input are more likely to have effective and enticing benefits programs and bonus structures. They are also likely to implement changes to their performance management systems that include flexible working options, a perk most employees are desperately seeking these days. If companies integrate employee ideas and preferences into their existing processes, this reduces the likelihood that they will jump ship for a rival company. The question of how managers can deliver great feedback has been a huge focus in the past few years — for good reason. Employees need to know how they are doing in order to improve in their roles. However, it is equally important for managers to learn what questions to ask to prompt feedback from their employees. 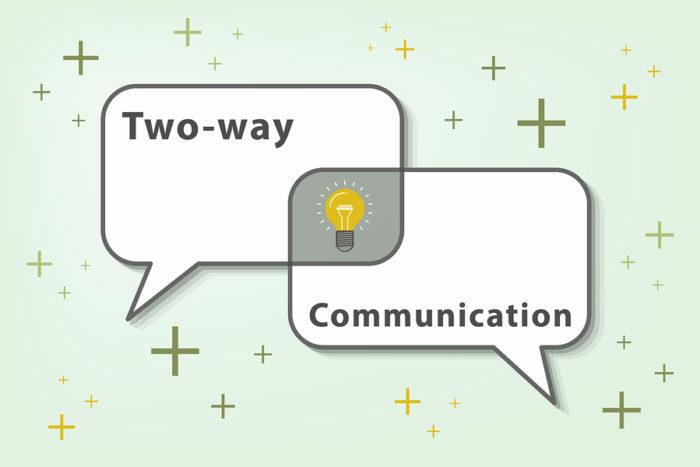 Without this training, employees won’t feel they have a voice, but once two-way feedback is perfected, a company has all the tools it needs to advance and succeed.